Usually, ovens are powered using electricity or gas. This experiment uses the sun’s own natural energy – or solar power – to heat an oven that bakes cookies. Use a pencil and ruler to mark 2.5cm (1 inch) in from each side on the pizza box lid and draw a square to connect the marks. Cut along the front and side lines of the square with the utility knife. Fold along the back line so that it acts as a hinge. Line the inside of the flap and the inside walls of the box with foil, and tape or glue in place. Seal the cut-out window shape by taping a sheet of plastic wrap over the hole. Glue or tape a sheet of black paper to the bottom of the inside of the box. Mix the cookie dough ingredients and roll into small balls, then flatten with your hand. Arrange the discs of dough on a sheet of foil and place on top of the black paper inside the box. Prop the cut-out lid at a 75 degree angle (approx) using a pencil and some tape. Leave outside facing the sun until cookies are ready (anything from 15-60 minutes). Carefully remove the cookies from the box and allow to cool – then eat! Solar ovens use heat emitted from the sun, called solar energy, to cook food. The foil reflects sunlight into the box, and the plastic wrap acts like a greenhouse by preventing the heated air inside the box from escaping. As more heat from the sun streams into the box, the air inside gradually becomes warmer. The black paper in the bottom of the box absorbs the warm sunlight, which in turn heats the food placed on top of it. 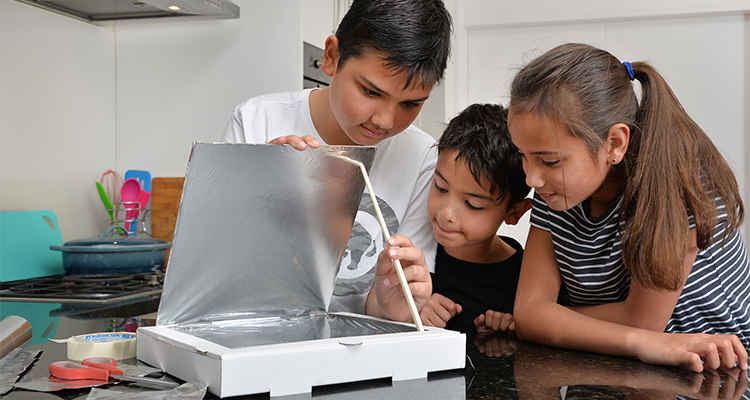 What other items can you cook in the solar oven? Could you bake a potato or even a pizza? Does changing the angle of the reflector flap change how efficient the solar oven is at cooking? Try using the oven on a warm but cloudy day. Does it still cook the cookies? Why do you think that is? 120ml (1/2 cup) cream or full fat milk. Add the cream, sugar, and vanilla to the small bag and seal, ensuring that any excess air is released. Place the ice, salt and cream-filled bag into the larger bag and seal. Vigorously shake the large bag over a sink for approximately 5 minutes. Stop when the cream has started to freeze and turn into a solid. Remove the small bag and quickly rinse off the salt solution with cold water. Pour the ice cream into a bowl, add your favourite toppings and enjoy eating your newly frozen dessert! Ice cream is an emulsion, or a mixture of two liquids (water and fats) which do not normally mix together. To make ice cream, the milk or cream mixture needs to change its state from a liquid to a solid. If the mixture was simply placed straight into the freezer, the wate component would freeze first, forming large, crunchy ice crystals. Ice cream tastes better when it is creamy rather than crunchy, so the goal in ice cream making is to create the smallest ice crystals possible. By vigorously shaking the bag, any large ice crystals that may be forming are broken up into smaller crystals, resulting in a smooth and creamy ice cream. The freezing point of ice is lowered by the addition of salt, so it starts to melt. As this ice melts it draws heat energy from its surroundings – including the cream mixture enclosed in the smaller bag – cooling it enough to cause the liquid cream emulsion to freeze, changing it from a liquid to a solid and forming ice cream. What happens if you do not shake the bag vigorously when making the ice cream? If you put too much ice cream in your mouth, you may suffer from what is called ‘brain freeze’ or an ‘ice cream headache’. Placing your tongue on the roof of your mouth should stop the headache – why do you think this is? Taste the ice cream frozen, then taste it again when it has melted. One should taste much sweeter than the other – why do you think this is? same principle to melt ice cubes in a way that lets you hold them with a piece of string! Place a cube of ice in the middle of the plate. Lay the string across the top of the ice cube and wait for 30 seconds. Lift the string up off the ice cube. Did it stick? Lay the string back across the ice cube. Sprinkle the salt over the top of the ice cube and wait for 30 seconds. Hold both ends of the string and lift upwards. The ice should be stuck to the string and you should be able to pick it up off the plate. Usually, ice melts and water freezes at 0o Celsius or 32o Fahrenheit. However, salt lowers the temperature at which ice can melt and water can freeze. By adding the salt to the ice cube, the ice around the string starts to melt, and the freshly melted water moves up on top of the string and re-freezes. This traps the string in a layer of freshly frozen ice, enabling it to be picked up off the plate. Pressure can also make ice melt at colder temperatures. This is how ice skates glide in ice rinks. The pressure from the blade melts the ice when the blade pushes down on it, helping the blade to glide easily on a thin layer of water, and so enabling the ice skater to skate! 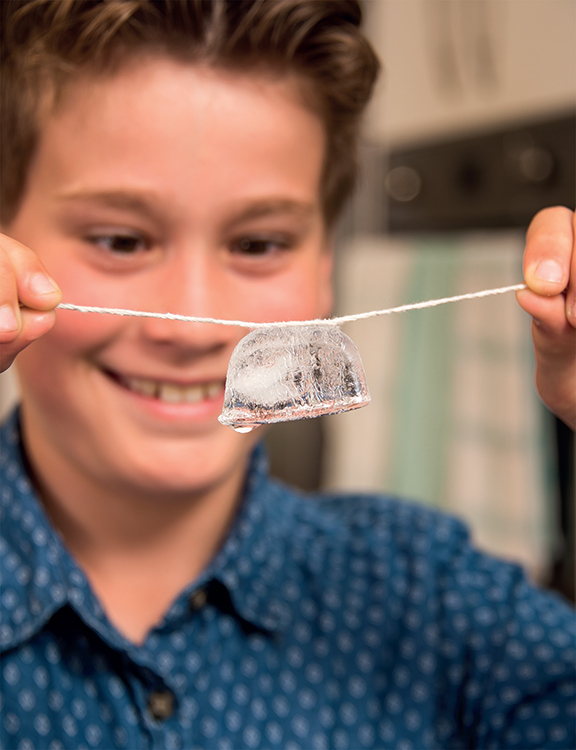 Can you lift more than one ice cube onto a piece of string? If you have access to different types of salt – such as rock salt or sea salt – do they work as well? What if you use other string-like materials – such as an elastic/rubber band or a strand of hair? 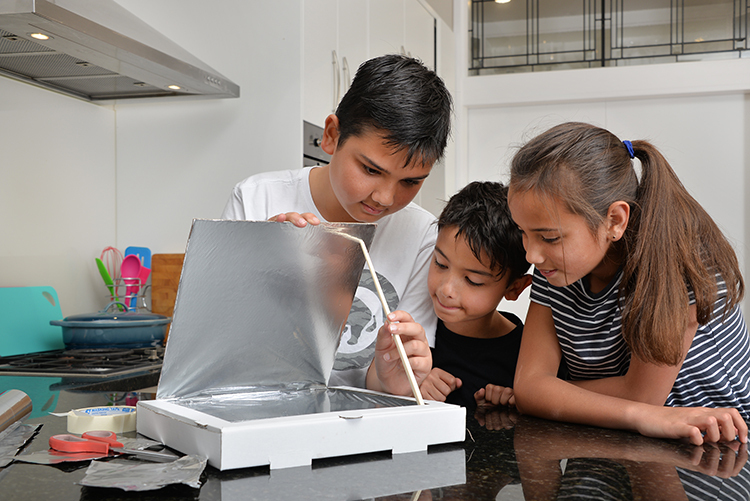 Dr Michelle Dickinson (MNZM) – prize winning nanotechnologist, researcher and educator – has made it her life mission to make science and engineering accessible for all. 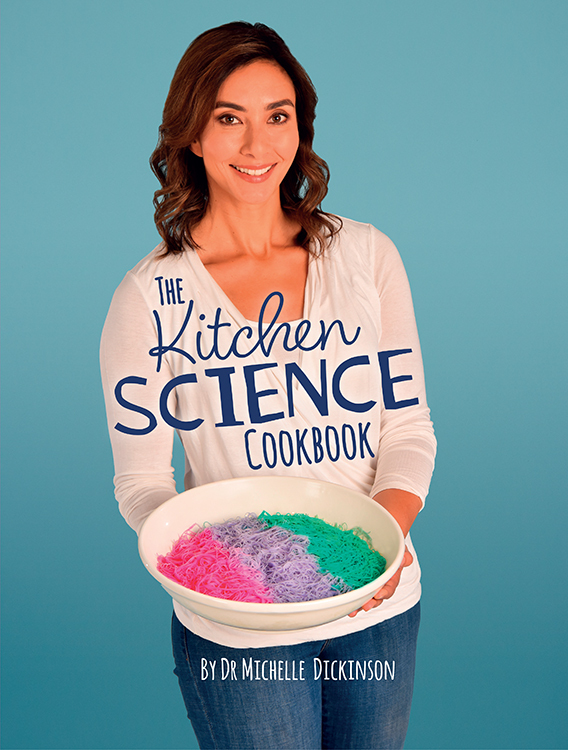 Her new book The Kitchen Science Cookbook is packed full of fun ‘recipes’, each teaching an important scientific principle in a format that is perfect for parents and children to enjoy together. Available on Amazon. Find out more at Nanogirllabs.